I'm an impatient sort of person. The more I worked on th sampler as a block of the month project, the more I became convinced that a lot of you might like this offered in a simpler and inexpensive manner. Instead of dragging the project out over twelve months, one block at a time. I'm offering it to you at a very special price in a very simple package (includes: pattern, cutting instructions and the Mini-Block Instruction Booklet). This offer will be delivered to you as a PDF file which you can download. You can purchase this quilt one of two ways. I have moved the PayPal purchasing options to their own special page. I would prefer you use the above "Purchase Sampler Quilt" option, as I feel it will be far less problematic for you to get your pattern. But, it's your choice (BUT PLEASE READ ALL the information on the new page). to be an easy first quilt for a novice quilter and a fun-to-make project. 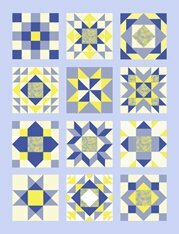 This is a great way to get started if you want to make a more traditional quilt than the One Block Only Quilts. Every pattern comes with complete step-by-step instructions, cutting instructions and fabric requirements for the whole quilt. Each pattern takes a mini-block such as “cat’s ears” and shows you how to build it. It also takes you step by step through the construction of the whole quilt so you can learn the basics. When you’re done, you will have tackled all the 'mini-blocks", made twelve beautiful blocks, and you will have a beautiful quilt to be proud of. Not to mention a beautiful "bonus block" pillow! *Want to learn more about The Sampler Quilt and it's identity crisis? ..........Click on the above link and read all about it's journey. $10 and $15 a month! You get a bonus block you can use in the quilt to replace any block, or make into a pillow.